An "emergency rule," that went into effect on July 1, is expected to increase the average solar installer's business by 10% to 30%. The state Building Code Council made it possible for homeowners to install rooftop solar power systems without an engineer's approval. This saves them between $500 to $2,500 in fees, and eliminates up to eight weeks of waiting time. It is the latest of the Evergreen state's policies meant to encourage business. Washington has some of America's Best Solar Incentives. There is no sales tax on solar electric and solar hot water systems under 10kW. The state is purchasing solar generation at $0.15/kWh until July 2020 and this amount increases if the equipment is manufactured in Washington. That rate is $0.18/kWh if you are using a locally produced inverter, $0.36/kWh if it includes the module and $0.54 if the entire system was manufactured in Washington. Customers of Seattle City Light are allowed to invest in community solar projects and credit the energy on their utility bill. This program recently funded an installation on the city's aquarium. These incentives are on top of the 30% Federal Government tax credit that is available through-out the US. "The current code language serves as a barrier to the growth of the residential PV installation business in Washington state. Currently many jurisdictions require costly engineering reports which delay permit approvals and result in additional fees. Under these circumstances some potential customers choose not to purchase and install the systems; some installers avoid doing business in some parts of the state due to extremely limiting regulations. Relaxing this requirement would provide additional capacity and allow the industry to continue to thrive in Washington state." There are some requirements, which are found in most installations. 1. The solar photovoltaic panel system shall be designed for the wind speed of the local area, and shall be installed per the manufacturer's specifications. 2. The ground snow load does not exceed 70 pounds per square foot. 3. The total dead load of modules, supports, mountings, raceways, and all other appurtenances weigh no more than four pounds per square foot. 4. 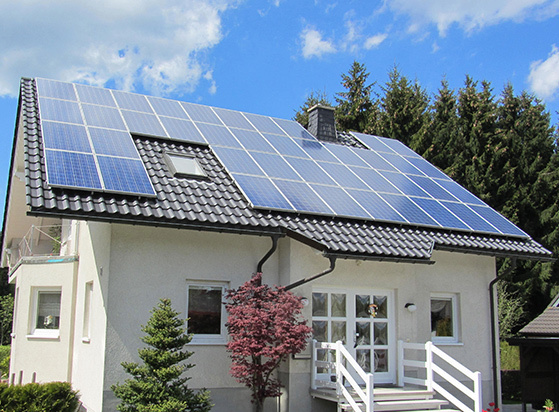 Photovoltaic modules are not mounted higher than 18 inches above the surface of the roofing to which they are affixed. 5. Supports for solar modules are to be installed to spread the dead load across as many roof‐framing members as needed, so that no point load exceeds 50 pounds. According Environment California's study "Shining Cities: At the Forefront of America's Solar Energy Revolution," Washington has between 5 and 25 times as much solar potential as its energy needs. One Washington's most impressive solar stories concerns a Seattle home that was designed to obtain 96% of its energy from a solar plus battery system. The new owner took possession last February and despite the fact it was mid-winter, found the system was adequate. This was emphasized when the switch connecting the house's connection to the grid was unwittingly left "off." It was three days before the mistake was discovered. The headquarters of one of the world's leading suppliers for off grid and hybrid systems, Outback Power, is in Arlington, Washington. One of their solar-plus-battery customers, who owns a small house in Snohomish, wrote, "It feels great to tell people that we only purchase $1 of electricity per day during the winter and produce most (if not all) of our power during the summer months." Seattle did not make the Environment California's list of "Top 20 Solar Cities" when the book came out last April. However Seattle City Light's customers were producing 7MW, as of the end of 2013, in an area that extend's beyond the city. It will be interesting to see how far Washington progresses the next time we see an evaluation.